The new American sedan Buick LaCrosse 2017-2018 model year was also presented in the US on the Los Angeles Auto Show 2015. What changes have occurred in the car? 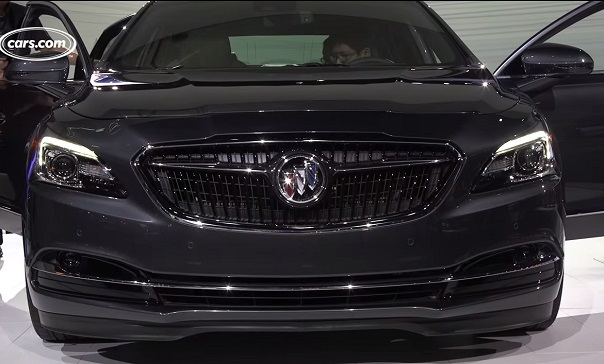 The new Buick LaCrosse is based on the latest GM-oh P2XX platform and may appear on the European market, under the name Opel Omega C.
New Buick LaCrosse due to the new platform with a wheelbase of 2905 mm increased significantly both outside and inside. But, interestingly, he has got a modern appearance and a refined interior, received a 305-horsepower engine working together with a new 8AKPP. Start of the third-generation model, sales of the Buick LaCrosse in the US is planned for the summer of 2016, the price of new items — from 32000 dollars. Manual GM company for a long time trying to revive and return to the European market Opel Omega, but somehow no avail. Interestingly, motorists in Europe and even Russia are looking forward to the debut of the new generation Opel Omega … already since 2003, when stopped producing the Omega B. Let’s hope that all the same to the light appears during 2016-2017, a new version of Omega sedan and is get to know and admire the American brother — sedan Buick LaCrosse 2017-2018 model year. The new platform and body P2XX new items made with extensive use of high-strength steel grades, which allowed one hand to increase the stiffness of the body torsion and bending, on the other hand reduced by 136 kg curb weight of the third-generation LaCrosse sedan compared to its predecessor. It is very important! — Lane Change Alert with Side Blind Zone Alert (system for monitoring blind spots mirrors) and a rearview camera. — 1460 mm in height with a 2905 mm wheelbase. Standard American sedan is equipped with 18-inch alloy wheels, as well as an option offered huge R20 wheels with low profile tires 245 / 40R20. Official photos and video with the new Buick LaCrosse juicy and bright convey a stylish and solid external image and interior of the American sedan. You look at the car and imagine how it will be possible to look new Opel Omega. SRAs menacing, predatory and even arrogant front end. Headlamp lenses with xenon and LED daytime running lights corners — like eyes of predatory birds, solid false radiator grille with active shutters closing at high speed for better aerodynamics, large bumper with bright plumage. This is very impressive! Side of the body of the new American sedan itself solidity and elegance. The long hood, dome-shaped roof line, large doors with compact lenses, mirrors on the legs, intense bursts vyshtampovok on the surfaces of the second row of doors and rear fenders, stylish food. Rear with original marker lamps with LED filling, trim the trunk lid and a powerful bumper with stylish decorative insert trapezoids behind which hoarded pipe mufflers. Interior of the new Buick LaCrosse due to impressive size wheelbase promises a comfortable accommodation not only to the driver and front passenger, but also sitting in the second row. — In the second — 1014 mm. The passengers of the second row of the American sedan can sit with legs extended, as in the saloon Skoda Superb. 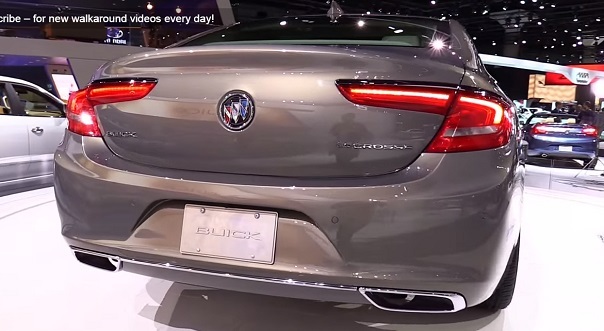 Furnishings Buick LaCrosse original and stylish, modern design solutions. Excellent look monumental front panel with inserts of wood, center console, easily flows into floating tunnel between the front seats, instrument panel trim, stylish multifunction steering wheel and a huge sunroof. Only the driver’s seat and front passenger with a soft pillow and a complete lack of lateral support. And it’s not very nice, it was necessary to foresee everything. The rest of the excellent interior of modern business-class sedan, while the Americans have hinted at new items belonging to the premium class. — Electric handbrake with Automatic Vehicle Hold system and Hill Start Assist, a lot of electronic assistants that we talked about above. Technical characteristics of the third-generation sedan Buick LaCrosse 2017-2018 year. For new items offered one uncontested gasoline engine V6 3.6L (305 hp 363 Nm), working together with the new automatic 8 (GM 8L90 Hydra-Matic). The motor is equipped with a system that disables the half cylinder (Active Fuel Management), and Stop-Start system. Suspension is fully independent with MacPherson struts at the front and five-link rear architecture. Default Drive front, the option of a four-wheel drive, adaptive dampers with Continuous Damping Control system. Book Car with large 20-inch wheels and front wheel drive the buyer will receive an additional high-tech suspension HiPer Strut with separate swivel. Interestingly, the same technical stuffing and will get a new generation of Opel Omega, or the Europeans will offer less powerful motors? « Lamborghini Aventador SV Roadster.